Tracking down the cause of an allergy isn't always easy. Like a clever criminal, the allergy trigger may lurk behind nonspecific symptoms, hiding the evidence and making a final verdict difficult. Consider Sean as an example. He has been a patient at The Montreal Children's Hospital (MCH) of the McGill University Health Centre (MUHC) since he was five. After coming into the emergency department with asthma-like symptoms he left with a diagnosis of severe hay fever and a ragweed allergy. Throughout the years, this condition was successfully treated. However, recently Sean returned to the clinic with a food allergy, which his mom attributed to watermelon. "Sean's mother was concerned that he was developing new allergies," says Dr. Bruce Mazer, Head of the MCH Allergy and Immunology Department. "However, unbeknownst to Sean and his mom, watermelon is a close cousin of ragweed, the trigger of his hay fever. What he was suffering from was not severe; it was a common allergy problem that hay fever sufferers experience called oral allergy syndrome." Approximately 30 per cent of hay fever victims develop oral allergy syndrome. These symptoms develop because there is a cross-reactivity between the hay fever trigger and the one stimulating the food allergy response, in this case, a similar protein in the watermelon. Unlike more severe food allergies, the symptoms are usually localized to just the mouth, tongue and throat. "We re-evaluated Sean's hay fever and showed that he is still very allergic to ragweed but not really that allergic to watermelon. This was a relief to his mother, knowing that she doesn't have a legion of new food allergies to contend with," says Dr. Mazer. Providing this holistic approach and a continuum of care is what the MCH Allergy and Immunology Department does best. The twelve-member staff includes physicians, nurses, respiratory therapists and receptionists. The team treats more than 6,000 patients a year, from neonates to young adults. It is one of the largest pediatric allergy and immunology practices in Canada. They hold more than nine clinics per week and diagnose everything from common food allergies to more complex immune deficiencies. 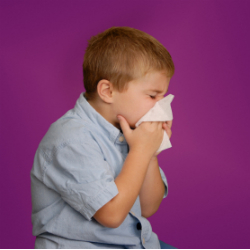 'We have six full-time pediatric allergists in the office and four individuals in community practice who join us for at least one clinic a week. This gives us a very broad base of experience, which is very good for our patients, and also provides an excellent academic environment," says Dr. Mazer. Food allergy is currently the most common diagnosis in the department; according to Dr. Mazer this trend has been evolving over the last 20 years. "Previously we would see more patients with respiratory allergy and asthma and now food allergies have become the biggest concern for parents and physicians--and it’s reflected in our practice. This seems to be a phenomenon throughout the developed world." Although this rise can be partially explained by increased awareness and vigilance on the part of parents, there is clear evidence that some food allergies are increasing in the general population. "Studies conducted by our MUHC research colleagues show that peanut allergies are on the rise in school-age children. The next steps are to determine why this is happening and to accommodate this expanding patient population," says Dr. Mazer. The department also specializes in diagnosis and testing for less common allergies, such as those from stinging insects, medications and vaccines. "We receive many referrals from community-based allergists who don’t offer this specialized assessment," says MCH nurse-coordinator Maria Harvey, an allergy specialist. "We are among the largest centres in Quebec to offer this pediatric care." "Between 15 and 20 percent of North Americans suffer from an allergic disease," adds Dr. Mazer, "which explains why we are extremely busy." Treating children with immune deficiencies, including children who produce no antibodies or those who have specific difficulties generating an immune response, is also a focus of the department. "Immune deficiencies are much less common, but are very debilitating," says Dr. Mazer. Happily, once diagnosed, many of these children can have good quality of life, either with at-home or in-patient care. Mark is one of these patients. "Mark was referred to our department when he was 11 years old,” says Dr. Mazer. "He had recurrent pneumonia for about six years and although his mother had been to see many doctors, she felt there was something wrong with her son's overall health and persevered in following up.” Because Mark was an unusually large boy and looked healthy, some of his symptoms were overlooked. Finally a colleague at CHU Ste-Justine performed a serum immunoglobulin test and determined that Mark made no antibodies, explaining why he was continually sick. “He referred Mark to us, due to our expertise in this area,” says Dr. Mazer. “When he first arrived, Mark had damage to his lungs, which we were able to reverse with physiotherapy and treatment. Most important, he continues to benefit from our supplemental antibody infusion program, which is life-saving for him." From bone-marrow transplants to intravenous antibody infusion, the MCH Department of Allergy and Immunology offers many super-specialized diagnosis and care programs for immune deficiencies. The department was the first in Quebec to provide supplemental antibody infusion for patients in their homes. Patients who are missing the immune cells neutrophils, or are missing vital neutrophil enzymes, are also treated by the department. "These patients have problems with skin infections, lung infections–mostly with bacteria or with fungus. They are treated with medications throughout their life, and they can actually be very ill if we aren't vigilant," says Dr. Mazer. The department also sees patients who are missing T-lymphocytes. These children are subject to severe viral, parasitic and bacterial infections. "Unfortunately, these children don’t always do well. They need to have a bone marrow transplant early in life, and if this doesn't occur, major complications and severe disease may follow. These are the challenging group of patients in our clinic," says Dr. Mazer. "Wouldn't it be great if we could vaccinate children against peanut allergies?" asks Dr. Mazer. "Think about the huge relief to thousands of parents and children." This approach may not be that far-fetched. Mazer and fellow MCH allergist Dr. Christine McCusker are studying how allergies occur at a cellular level and this may bring them one step closer to solving the peanut allergy issue. "Dr. McCusker is using animal models to study the best way to vaccinate neonates to prevent allergies. She is coming up with some interesting strategies, which may translate into the development of therapeutics," says Dr. Mazer. Other research programs conducted in the department include the development of an oral desensitization program, the evaluation of the safety of the flu vaccine (both the H1N1 flu vaccine and the flu vaccine in egg-allergic patients), and a peanut allergy assessment registry, which involves evaluating the demographics and the treatment, as well as school strategies and coping strategies. "Our training program is very strong," says Dr. Mazer. "We decided that the best thing we could do is train allergists and send them into whichever Quebec community they are most needed. We continue to interact with our outside colleagues and we have an annual retreat, where we all learn about the latest disease trends and treatments." This ongoing training is not only beneficial to physicians, it is an important factor in helping patients like Mark since it can translate into earlier diagnosis and reduced long-term consequences. For more information about the retreat visit www.childrensallergy.com.